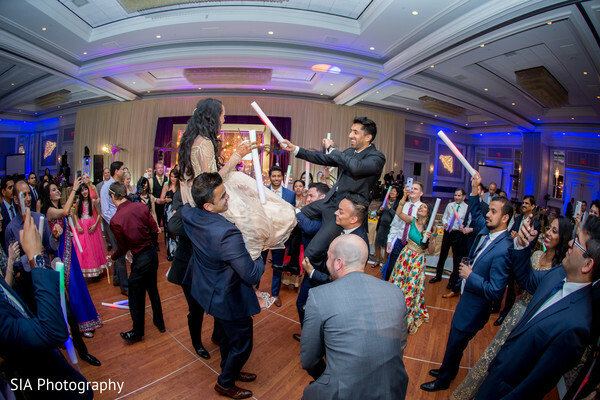 Where to even begin talking about the amazing wedding of Puja and Amey? The bliss, the love and the unforgettable moments were part of their main events! 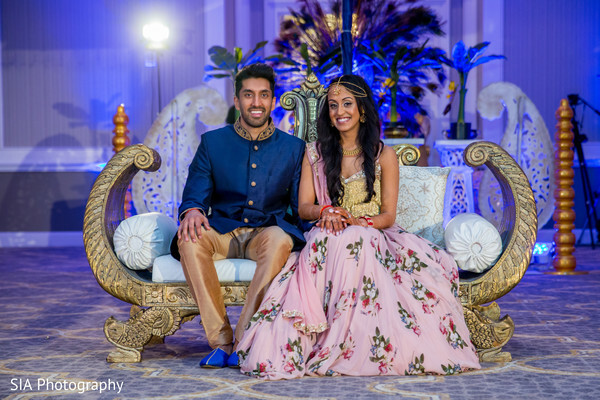 Surrounded by bright lights and their dearest ones, these soulmates celebrated their extraordinary Sangeet at the splendid Hilton Columbus at Easton. 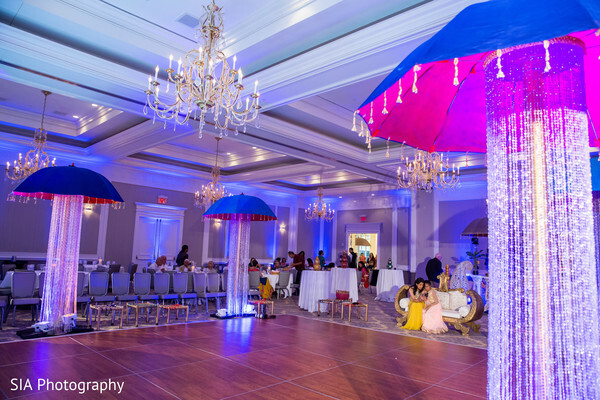 The memorable night was a visual treat with lots of pop color drapery, a vibrant dance floor encircled by flashy umbrellas designed by B3 Event Management. Our sweethearts assembled the most beautiful Sangeet outfits we have ever seen! 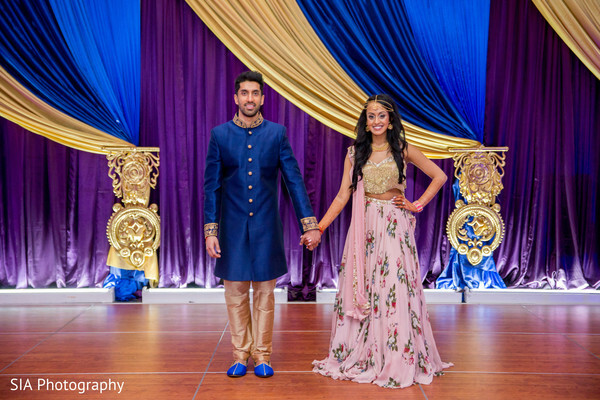 A gorgeous pink floral lehenga skirt paired with a golden choli blouse was Puja’s choice while Raja Amey celebrated with a seriously elegant royal blue Sherwani with an exquisite golden embroidery work on the neck and wristbands! 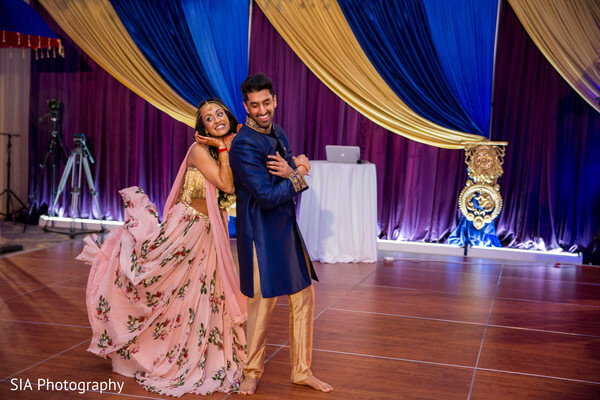 SIA Digital Studio saw these two dancing and having the time of their lives in the evening of their big day and have for us a sneak peek of the joyous festivity in our full gallery! I met my groom through online dating. I knew he was the one when we couldn’t stop talking to each other. We would text 24/7 and could talk about literally anything without getting bored! The proposal was such a surprise! I was out to brunch with a friend and when I came back to the apartment, there were candles and rose petals all over. After he proposed, he surprised me with a video of all my family & closest friends sharing their congrats. We spent the rest of the day celebrating with our friends. It was perfect! 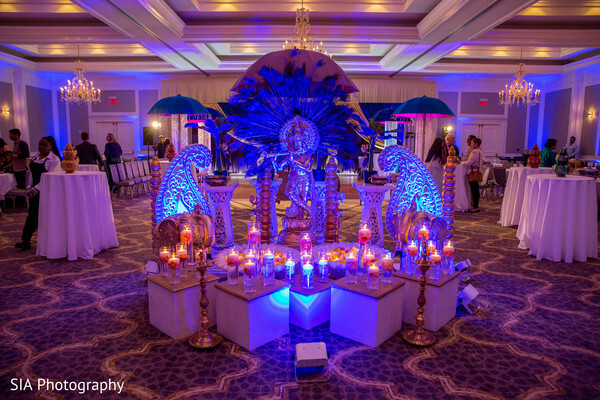 Planning an Indian wedding is always stressful based on the number of events there are but everything turned out perfect! Since I work in the creative industry and already had a vision for how I wanted everything to look, it didn’t take me long to find vendors who could make it all come to life. I wanted a jewel tones decor & floral theme that was unique from what other people have done. I also wanted palm trees running down the aisle which turned out amazing! The most important details for me were the food and the DJ- which both turned out amazing!! 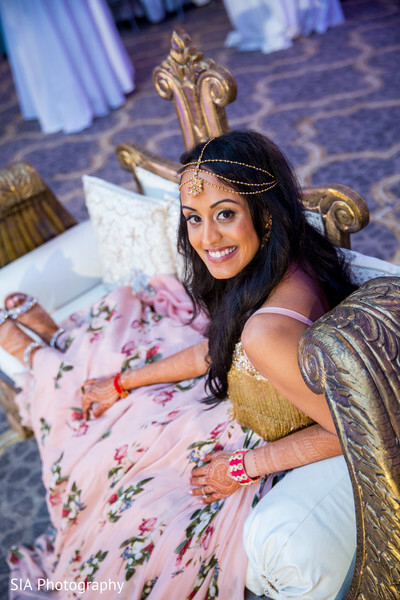 All of my dresses came from India and I wanted colors that would coordinate well with my decor for photos. I chose burgundy and gold for my wedding outfit & my groom's and navy for the wedding party. Although I loved my wedding outfits, my favorites were my Sangeet and reception dresses. 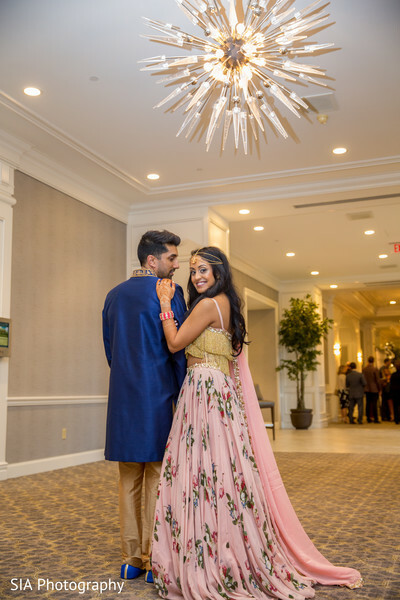 My Sangeet dress was a pink floral lehenga from Mahima Mahajan and my reception dress was custom made from Gaurav Gupta. Based on what our friends and family have told us, everyone especially loved the food at all the events and how smooth and organized the entire weekend was. Everything was perfectly on time and all the dances and speeches were fun and ran pretty quickly! The most memorable moment of the wedding for me was walking down the aisle with my dad. It was so surreal seeing all my family and friends in the same room and it made everything finally feel real. I also loved the reception after party we had. My sister planned for a huge buffet of food for everyone (including chips & queso- my favorite) and it was so much fun just relaxing and being able to hang out with all our family and friends. My favorite decor for the weekend was the Sangeet. My decorator and I had spent the least time discussing it but it turned out so amazing and we even had a bike trolley to take photos with. We also had dances and singers perform at the Sangeet which was so much fun! I also loved our reception cake. I had found the exact cake I wanted on Pinterest & Short North Piece of Cake was able to duplicate it exactly! Don’t stress about the planning! Have fun with it and let the little things go because you won’t even notice them on the day of and everything will turn out great! Wait for the return of this glam affair in our next feature! Short North Piece of Cake is a member of the Platinum Guide. Love what you see? Explore their portfolios.